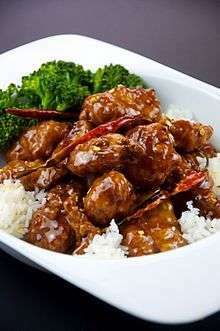 General Tso's chicken (pronounced [tsu̯ò]) is a sweet, slightly spicy, deep-fried chicken dish that is served in North American Chinese restaurants. The dish is named after Zuo Zongtang (formerly romanized Tso Tsung-t'ang), a Qing dynasty statesman and military leader, although there is no recorded connection to him nor is the dish known in Hunan, Zuo's home province. The food has been associated with Zuo Zongtang (Tso Tsung-t'ang) (1812–1885), a Qing dynasty statesman and military leader from Hunan Province. Zuo himself could not have eaten the dish as it is today, and the dish is found neither in Changsha, the capital of Hunan Province, nor in Xiangyin County, where Zuo was born. Moreover, Zuo's descendants, who are still living in Xiangyin County, when interviewed, say that they have never heard of such a dish. The dish or its variants are known by a number of names, including Governor Tso's chicken, General Gao's/Gau's chicken, General Tao's chicken, General Tsao's chicken, General Tong's chicken, General Tang's chicken, General Cho's chicken, General Chau's chicken, General Joe's Chicken, T.S.O. Chicken, General Ching's chicken, House Chicken, or simply General's Chicken. The linguist Victor Mair, commenting on the various names for the dish and problem of getting them straight, says that he has not seen the spelling "General Zuo's Chicken", that is, using the now standard pinyin romanization, but that he expects to see it soon. Fuchsia Dunlop argues that the recipe was invented by Taiwan-based Hunan cuisine chef Peng Chang-kuei,  who had been an apprentice of Cao Jingchen (曹藎臣), a leading early 20th-century Chinese chef. Peng was the Nationalist government's banquet chef and fled with Kuomintang forces to Taiwan during the Chinese Civil War. There, he continued his career as official chef until 1973, when he moved to New York to open a restaurant. That was where Peng started inventing new dishes and modifying traditional ones; one new dish, General Tso's chicken, was originally prepared without sugar, and subsequently altered to suit the tastes of "non-Hunanese people". The popularity of the dish has now led to it being "adopted" by local Hunanese chefs and food writers, perhaps as an acknowledgment of the dish's unique status, upon which the international reputation of Hunanese cuisine was largely based. Ironically, when Peng opened a restaurant in Hunan in the 1990s introducing General Tso's chicken, the restaurant closed without success, as the locals found the dish too sweet. Peng's Restaurant on East 44th Street in New York City claims that it was the first restaurant in the city to serve General Tso's chicken. Since the dish (and cuisine) was new, Peng made it the house specialty in spite of the dish's commonplace ingredients. A review of Peng's in 1977 mentions that their "General Tso's chicken was a stir-fried masterpiece, sizzling hot both in flavor and temperature". Peng passed away from pneumonia in November 2016 at 98 years old. New York's Shun Lee Palaces, East (155 E. 55th St.) and West (43 W. 65th St.) also says that it was the first restaurant to serve General Tso's chicken and that it was invented by a Chinese immigrant chef named T. T. Wang in 1972. Michael Tong, owner of New York's Shun Lee Palaces, says, "We opened the first Hunanese restaurant in the whole country, and the four dishes we offered you will see on the menu of practically every Hunanese restaurant in America today. They all copied from us." It has also been argued that the two stories can be somewhat reconciled in that the current General Tso's chicken recipe—where the meat is crispy fried—was introduced by Chef Wang, but as "General Ching's chicken", a name which still has trace appearances on menus on the Internet (the identity of its namesake "General Ching" is, however, unclear); whereas the name "General Tso's chicken" traces to Chef Peng, who cooked it in a different way. Sauce: soy sauce, rice wine, rice wine vinegar, sugar, cornstarch, dried red chili peppers (whole), garlic. Dish: Broccoli, chicken dark meat (cubed). The name used for the dish varies. At the United States Naval Academy, the dish is served in the main mess hall, King Hall, as "Admiral Tso's Chicken", reflecting a nautical theme. Outside North America, one notable establishment that serves General Tso's chicken is the Taiwanese restaurant Peng Chang-kuei, which is credited by some sources as the inventor of the dish. Differences between this "original" dish and that commonly encountered in North America are that it is not sweet in flavor, the chicken is cooked with its skin, and soy sauce plays a much more prominent role. A typical restaurant serving of General Tso's chicken may include up to 1,300 calories, 11 grams of saturated fat and 3,200 milligrams of sodium  as well as exceed 300 mg of cholesterol. One serving will typically be about 4 oz. (approximately 100 grams) of chicken thigh meat which contains 20-30 grams of protein, greater than 30% of the daily recommended niacin needs and over 15% of the recommended B6, phosphorus and zinc needs. Pizza effect – the phenomenon of elements of a nation or people's culture being transformed or at least more fully embraced elsewhere, then re-imported back to their culture of origin. 1 2 3 4 Dunlop, Fuchsia (February 4, 2007). "Hunan Resources". The New York Times Magazine. Section 6, Page 75. Retrieved 2009-01-09. 1 2 3 4 5 6 Lee, Jennifer (2008). The Fortune Cookie Chronicles: Adventures in the World of Chinese Food. Twelve Books. ISBN 0-446-58007-4. ↑ Lo, Eileen Yin-Fei (1999). "Transplanting Chinese Foods in the West". The Chinese Kitchen. calligraphy by San Yan Wong (1st ed.). New York: William Morrow and Company. p. 416. ISBN 0-688-15826-9. ↑ Sheraton, Mimi (March 18, 1977). "A Touch of Hunan, A Taste of Italy". The New York Times. New Jersey Weekly section, Page 68. Retrieved 2007-04-26. ↑ Everington, Keoni. "Inventor of General Tso's Chicken dies in Taipei at age 98 | Taiwan News". Taiwan News. Retrieved 2 December 2016. ↑ "The Search for General Tso" (Movie). Ian Cheney. 2014. "7 Chefs on the Enduring Appeal of General Tso's Chicken," Grub Street (January 8, 2015). Wikimedia Commons has media related to General Tso's Chicken.